What a busy holiday season we’ve had! It’s been a little while since my last post, but I’ll now be back with more regular updates! I hope you all had a fabulous Christmas and wonderful New Year! 2016 is here, and what a year it’s going to be. It’s time for a fresh start for all of us, and I know many of you have mixed feelings on New Year resolutions, but you can change your outlook, you can be positive and make changes for a better you. There’s no time like now to start being the best version of yourself and make your wildest dreams come true. You alone have this incredible potential to create beautiful things, and inspire the world! My mantra for life is to dream big and make it happen, but it’s much easier said than done. I have so many journals that I fill up with my hopes, inspirations, dreams, plans and document my achievements, and I highly recommend you do the same. I find that having a pretty journal will encourage me to put my heart into it, I love glamour in all forms. I love brain storms, putting into words what I want to succeed at really will aid in actually bringing this into my reality. I have two main pages for this, I have my dreams listed, with another page on the how I can achieve them through my work, my outlook and so much more, and then throughout this I scheme, plan and experiment with ideas. Once you have this it’s time to start small, in your journal plan how you can make this happen, write down everything, a great journey starts with a single step. When we think of New Year’s resolutions we often dream big, and sometimes fail because we don’t break this down to something achievable and think it will happen overnight, when it will in fact take much hard work. Last year while studying a dance teacher told us that success is keeping the same energy between failures until you make it, and this is such a big aspect to making your dreams come true. I think if you are passionate about something, I mean truly passionate you can move the earth to make it happen! Good things don’t come to those who wait, you’ve got to work harder than you ever have before and you’ll be able to make it happen. Now you have your journal, and you’ve looked at what you want to achieve work on it every single day! To keep your focus, you need to stay motivated and inspired, I’ve written a blog “Keeping Inspired” from a time when I had a creative lull, with lots of tips on how to keep yourself feeling fresh and engaged on what you’re trying to achieve. Recently I’ve hit a darker time in my life, and the only person who could get me out of this space was myself being positive. For a lot of things in this world you can’t change, but you can alter your outlook. The hardest part is identifying when you acting or reacting in a toxic way, when you feel upset, annoyed, or another negative thought you need to think on this, and you need to apply positive thinking. It’s so easy to become negative, but the world is much happy place if you push to think happy thoughts. We learn from our mistake and failures, take time to appreciate something, and let it go, for the longer you hold it, the more it will consume you. Positive thinking has so much power, you can make it the fuel for your life. I think the energy you put into this world comes back to you, I try to be as positive as I can be, I treat others with kindness and try my best to support my local vintage community as best as I can. I want the world to be like this, but I can only do my part and encourage others to do the same. I think this can be the hardest step, but nothing great was achieved within your comfort zone. If you’re dreaming big (like I hope you are), this dream is something usually that you’ve got to go outside your comfort zone to achieve, many of my fellow pinup friend wish to improve their confidence, and entering a pinup contest, and I think this is a perfect example of where you need to push through what you’re fears are and make great things happen. Again this is something easier said than done, but outside our comfort zone we gain confidence, and we have the power to do anything. Imagine a world where Dita Von Teese didn’t dare to be herself and create so much beauty, imagine a world where Gil Elgren didn’t share his amazing artistic talents with the world, and now imagine your potential, it would be a crime not to share all you can do with the world, and help inspire other people who are in the same place as you. You have nothing to lose, and everything to gain! With each milestone you attain you should celebrate this, whether it’s buying yourself a treat, sharing this with those around you or as simple as making a note of how fabulous you are, it will really aid you obtaining your hard work ethic. With your big goals its too easy to feel like you’re going nowhere fast, but each little step is taking you there, keep working hard and one day you’ll be able to celebrate that big dream! Celebrating your success really goes hand in hand with counting your blessing every day. Be thankful for those around you who support, appreciate all you have, and all you’ve achieved. Make 2016 glamorous, and make your dreams come true! ps- If you have any advice for newbies trying to get there name out there that is always appreciated!! 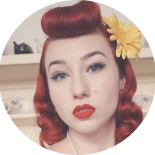 This entry was posted on January 6, 2016 by Miss Lady Lace in Pinup and tagged 1950, 1950's, 1950's glamour, 2016, Dita Von Teese, gil elvgren, glamour, Lady Lace, make 2016 fabulous, make 2016 glamorous, miss lady lace, new year, new years resolution, nicole, perth pinup, perth pinup community, pinup blog, pinup blogger, pinup girl, retro, vintage blog, vintage blogger, vintage fashion, vintage girl, vintage glamour, vintage life, vintage living, vintage pinup.